The whimsical Three Crows Pumpkin Delivery Towel brings a smile for Fall! This Flour Sack Towel features an old rustic red truck full of seasonal pumpkins and a scarecrow. Made of 100% cotton, with a convenient tab on the back for display or drying. 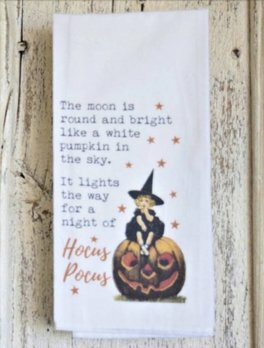 Add a touch of Halloween whimsy to your kitchen with the 1803 Our Hocus Pocus Towel. This flour sack towel is a fun way to show your personality this Fall. "The moon is round and bright like a white pumpkin in the sky. " Made of 100% cotton.